At my church gig yesterday, I chose a set that guaranteed that I’d get to play LOTS of guitar. Normally, I have to split my time between piano and guitar, especially when we don’t have a drummer or bass. Thus, for the past few weeks, since either our drummer or bassist has been out of town, I’ve only been bringing an acoustic guitar, and playing it for only a couple of tunes. However, yesterday was different. Not only did we have a bassist, we had a guest drummer, which meant that I could stay on guitar most of the time since we also had another rhythm guitar. I debated with myself on what amp/guitar combo I’d bring. Normally it would be my DV Mark Little 40 which is VERY versatile, but after looking at the set list, I figured I needed a bright, vintage Marshall sound. So I took my trusty Aracom VRX22 off the shelf, packed up my rig in my car, and set off to church. 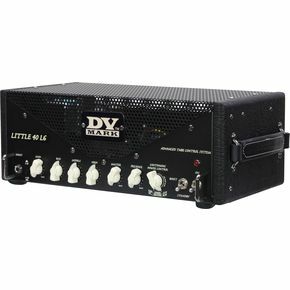 But thinking back on the set, no other amp would’ve done – even my DV Mark Little 40. The music demanded a Marshall-esque sound. While my DV Mark can get close, there’s a certain inexplicable quality that I was after that would be difficult to capture with another amp. I mentioned the DV Mark Little 40 at the end of my previous post yesterday, which was a review on the DV Mark Galileo 15. That Galileo is a great little amp, but the DV Mark Little 40 is what I’m really taking a serious look at right now. If you want more information and specs on this great little amp, then read the product page on it. But what I’m going to discuss here goes beyond just the plain old facts and talk about why I think this amp deserves such a serious look. What about the title? Well, it’s something that I brought over from my web engineering background, and that is that the best web sites aren’t the ones that are the prettiest or the most technically robust. They’re the ones that are so obvious to use, you don’t have to think about it. With the Little 40, DV Mark has lived up to “Don’t Make Me Think” in a variety of ways. First off, while DV Mark offers the amp in L34 and L6 models (for EL34 and 6L6), the amp can take either, and will even do 6V6’s (though I think it may have to be JJ 6V6’s that’ll take a higher plate voltage – but I’d have to confirm that). But here’s the kicker: With the Little 40, you’ll never have to bias tubes again! The Little 40 sports smart circuitry that will auto-bias AND match your power tubes (so long as they’re within 20% of each other). How convenient is that? I don’t have the equipment to bias tubes myself – frankly I’m scared to death of working on electrical stuff – so every time I get new power tubes, I have to have someone bias them for me. With the Little 40, I just need to get reasonably matched tubes, and the amp will bias them to their optimal settings. Damn! In addition to automagically biasing the tubes, there’s a switch on the rear panel that lets you set Low or High bias settings, which means you have even more tonal capabilities at the flick of a switch. This is a really huge thing in my opinion because again, instead of having to do this by hand, you need only toggle a switch to find the right bias setting for what you’re playing. Also, the Little 40 is absolutely versatile, with its patent-pending Continuous Power Control that allows you to vary the output power of the tubes – not just for volume, but to break up the power tubes early. Full out to 40 Watts, you’ll get maximum clean headroom. But you can dial down the power to 1 Watt, and get breakup a lot earlier. Plus, you can switch between pentode and triode tube operation to get different tones on top of bringing the power down. Then on top of all that, you have a 0/6dB pad to compensate for passive and active pickups. Finally, at $799, which is only $200 more than the Galileo, getting this amp is absolute no-brainer! And mind you, these amps are all hand assembled in Italy. How DV Mark is able to sell them so inexpensively is beyond me, but we players can definitely reap the benefits. This is my next amp!